Today marks the beginning of the 2018 minor league season for Iowa, Tennessee, Myrtle Beach, and South Bend. Eugene, the two Mesa clubs, and the two Dominican squads begin in June. While spots may be limited—or even almost nonexistent—in Chicago for upcoming prospects, there are still several young players who could make a name for themselves this summer. Last year, Adbert Alzolay shot all the way up to number one on several prospect lists, including BP’s. Who are some names that could help themselves in the first half of the year, and, hopefully, the Cubs at some point in the near future? 1. Dakota Mekkes – The 6’7″ right-handed reliever should begin the year at Double-A Tennessee. Last year, he dominated two levels of full-season class A baseball with an the ERA under one. The only issue he has to work on his reducing the number of walks. While he only throws 91 to 93 miles an hour, his deceptive delivery makes it look like 95 to 97 to the hitter. 2. Miguel Amaya – The young 19-year-old catcher will begin the year a low Class-A South Bend. He’s not gonna be in Chicago by the end of the year, but he is definitely a prospect to keep an eye on. He was blessed with a golden right arm that still needs to work on some of the small things of catching. His bat started to come around in August (.294 AVG with a .342 OBP) last year in Eugene, and that hopefully can carry over to the spring in northern Indiana. 3. Alex Lange – The Cubs second first round pick from 2017 will start the year at Myrtle Beach. While he only pitched 10 innings as a cub last year in Eugene, his curve and developing changeup will be worth watching every night. One of the things that doesn’t show up in a box score about Lange is his intensity to win. That intensity to be the best should carry him to Tennessee, as his curve should be too advanced for A ball. 4. 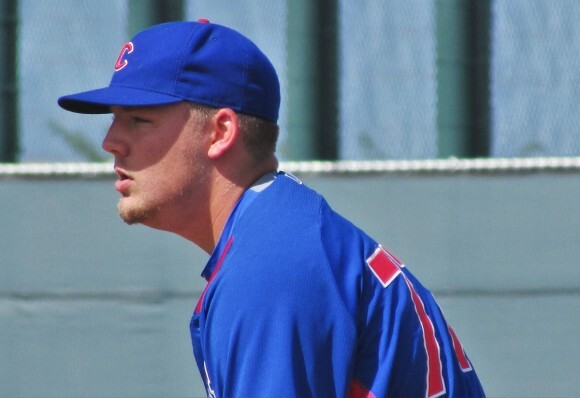 Any current Cubs’ prospect list is littered with pitchers. While there are some good hitters in the system, there’s no player who currently has just flat out dominated a league like Bryant, Schwarber, or Baez did. One guy who could possibly do that, though, is Wladimir Galindo. I often refer to him as “my guy” since he debuted in the Venezuelan Summer League in 2014 at 17-years-old. Now 21, the injury bug has hampered his ability to get at-bats. To date, he only has 699 career trips to the plate. However, those bugs have not overly hampered his development. If he stays healthy at Myrtle Beach, the 6’3” 210 pound third baseman could put on a nice display of hitting in the Carolina League. 5. Thomas Hatch – Tennessee is going to have plenty of firepower in their rotation in Alzolay, de la Cruz, Trevor Clifton, Duncan Robinson, and Thomas Hatch. It’s not as if anyone is going to sneak in under the radar, but Hatch’s stuff should play up in his second full season as a pro. Limited by an inning count in 2017, Hatch will have free reign to pitch his entire arsenal along with his new four seamer he worked on last year. I found it odd that he added that in 2017, but it makes sense when you consider he did not really need one in college. 6 and 7. Austin Upshaw/Jared Young – The two 2017 draft picks both hit from the left side, both mainly play second base, and both have excellent approaches at the plate. Both also have been doing well in spring training, but I am excited to see how they do starting today. Upshaw will be in Myrtle Beach to begin the year, and Young will start in South Bend. At the end of the year, the two were the hottest hitters in the system. 8. Bailey Clark – He is back healthy and back throwing hard. With his degree from Duke out of the way and minor injuries healed, Clark spent the winter weight training. While he still needs to work on his command, his velocity has returned to the mid-to-upper 90s. Whether he becomes a piggyback starter at South Bend or takes the bump at the beginning of a game does not matter. His significance is straight gas with a hard biting slider. In August at Eugene last year, he put up a 1.69 ERA. The potential is there, he just needs to put it together. And as usual, there is always going to be that surprise prospect who outperforms the collective consciousness of prospect awareness: aka a breakout. Those are always the most fun. Remember the names of Austin Filiere and Tyler Peyton.